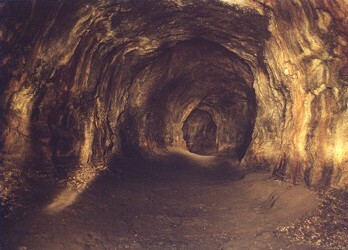 Ape Cave lava tube, is the longest intact stretch of lava tube (12,810 feet or 3.9 kilometers) in the conterminous United States (similar tubes are found in Oregon, California, and Idaho) and one of the longest in the world. The cave was constructed by a pahoehoe flow that crusted over; soon after, the molten lava on the inside drained away, leaving the outer crust in place. Lava stalactites and stalagmites and flow marks can be seen on the walls and floor of the cave. Lava stalactites, conical or cylindrical deposits of lava that hang from the ceiling of a tube, are formed by dripping; stalagmites are similar in shape and are formed on the floor of the tube by the accumulation of drips from the ceiling. Some time later, a sandy lahar flowed into the cave, possibly in A.D. 1480 or 1482 because the deposit contains white pumice granules that resemble W tephra. During the summer, a national monument interpretive naturalist leads tours through the lower part of the cave. Be sure to read the brochure (available at the cave entrance) to find out more about the cave and the equipment you will need if you plan to explore on your own. (Sturdy shoes or boots, warm clothing, an d three sources of light are recommended. Named by members of an outdoor group called the Mt. St. Helens Apes, this cave has two different exploration routes: the upper cave and the lower cave. The lower cave is a relatively easy 0.75 mile hike that takes 1 hour round trip. 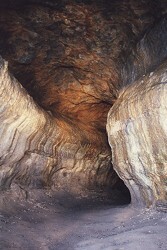 The challenging upper cave is 1.5 miles long, requires climbing over large piles of rocks and takes 2.5 to 3 hours. The cave dead-ends at a tiny crawl, that is too small to fit through. All the bats that used to inhabit this cave are gone now, as the cave has become a tourist attraction. Also gone are many species of molds and fungi that used to attach themselves to the lava formations. We've strolled numerous times through both the upper and lower caves, and it's a fun, if touristy, thing to do. Portions of the cave are even suitable for small children.